My Oats of choice are Jumbo Rolled Oats. Maybe not as popular as the popty-ping (Welsh for microwave) sachets of oats that you blast in the microwave into a stodgy mess. But, if you’re having these, then at least you are having oats. The consensus is that universally, oats are good for us. Oats contain a particular type of fibre that lowers cholesterol and helps prevent heart disease. The fibre acts also as a pre-biotic and is a good source of food for our friendly gut bacteria, so helps grow a great healthy microbiome. This fibre is Beta-Glucan, and I’ve recently seen that some manufacturers are now popping this fact on the front of the porridge packets. 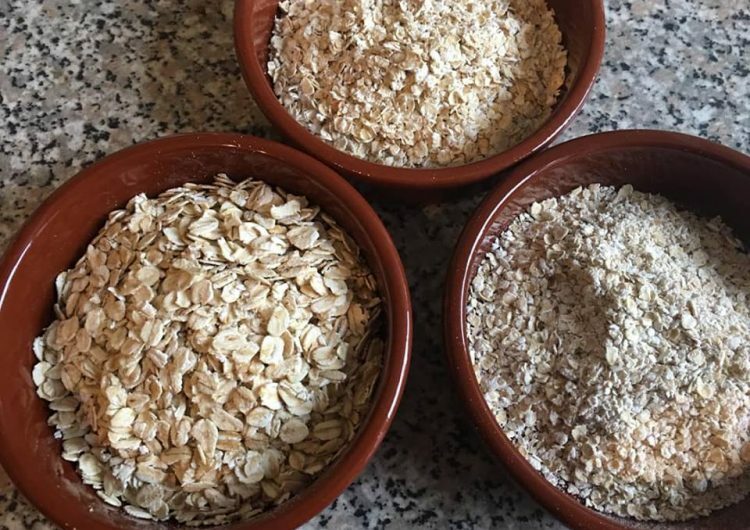 Porridge, although a carbohydrate is a slow release food, meaning it is a low GI food, the benefit of this is that it doesn’t spike your blood sugars, which then helps Insulin production. These Beta-Glucans are the reason your porridge gets gluey and so form a thick gel like substance once digested which helps you feel fuller. Porridge is also full of great nutrients for your body, protein, iron, zinc, magnesium, antioxidants, vitamin B, vitamin E and phytochemicals—all helping to build your immune system. And this is where I make a decision as to which type of Oat to purchase. Don’t get me wrong any porridge is better than no porridge, BUT, please don’t buy the flavoured type, as they are full of added sugar and salt and ‘flavours’. Buy the plain oats-nothing added and add your own topping-blueberries, banana, peanut butter—the choice is endless. If you really need a sugar hit then go for Brown Rice Malt Syrup, as this is also a complex carbohydrate. I don’t see any point in having non-blood sugar spiking porridge and then adding rocket inducing blood sugar spiking sugar to it! This way you always know what you’re eating. 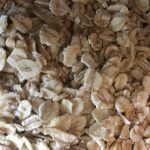 But here’s where I differ on the different types of Oats to use. 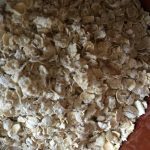 I use Jumbo Rolled Oats-these are huge, and the benefit of that, is they will naturally take longer to be digested in your stomach the bigger they are. Then we come onto the Microwave Oats. 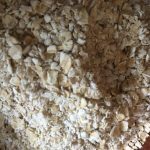 These oats have been processed until they are really fine, so they will cook effectively in the microwave. Sometimes, they aren’t much more than powder. Highly processed from that point of view and therefore release their sugars much faster and can indeed cause a sugar spike. And, as they’re smaller, they won’t keep you as full for so long either. So, how do I cook my porridge? I use 3 cups of water to 1 cup of oats. I may add more as I’m cooking, as some Oats are more gloopy than others. It’s the first thing I get ready when I’m doing breakfasts for guests. I pop the saucepan on a high heat and get it to boiling point and then I pop a lid on the saucepan and I pop it in the bottom oven of the Aga to do it’s stuff until the guests are ready. The slow cooking of the Aga means that all the lovely creaminess is drawn out of the oats and you’d really believe you were having oats made with milk—a great way to save on calories, if that’s what you’re watching! 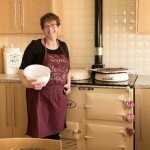 The magic of an Aga! I don’t have an Aga, I hear you say! Hey, ho! So here’s what to do instead. I have a few options for you. Jumbo Oats are harder and take more cooking. You can break them down in 2 ways; firstly, you can soak them overnight in water. By soaking you get all the creaminess out of the oats and really, you don’t need any milk then (if you’re a milk fan). Just pop a cup, or whatever measure you wish, in a bowl and add 2.5 the amount of water. Cover and leave in the fridge. Then in the morning these will be ready to heat up on the hob, with maybe a little more liquid. At this point if you’re a real milk (or milk substitute fan) then add your liquid of choice rather than water. If you want it super creamy add a bit of cream! The other way is just to slow cook them over a low heat on the hob, I’d keep stirring as they sometimes have a habit of sticking. Same amount of water and add more as required. Then just add your favourite toppings! My favourite porridge combo is porridge with water, topped with our homemade Soaked prunes, with Chia, linseed, sesame, sunflower, pumpkin seeds. I like to get a good dose of seeds as they are super packed with great fantastic nutrients for our body, and I feel my body needs all the help it can get! Put oats, oatbran and wheatgerm in a bowl and add milk to cover-make it a big enough bowl as the contents will swell. Serve in a nice bowl-it deserves it! To try our breakfasts for yourself and book yourself a stay click here to choose your perfect room!